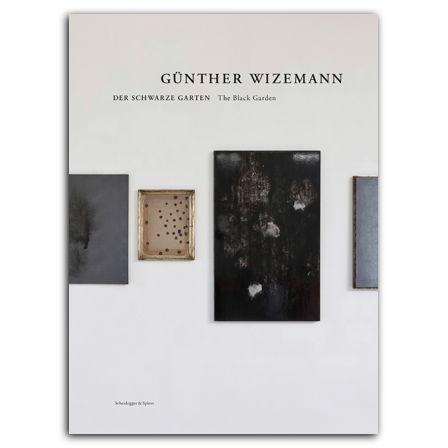 Günther Wizemann’s series The Black Garden comprises forty-three paintings created between 2003 and 2013. Strongly influenced by the Russian modernists Kazimir Malevich and Aleksander Rodchenko, Wizemann has long mulled the question of what one could possibly paint in the aftermath of the modernists. Italian artist Mario Merz’s statement-making installation, Che Fare?, which sought to push the boundaries of art beyond traditional painting and sculpture, has been equally influential on Wizemann’s practice. The Black Garden was created as a possible response to these questions. Published as a collection for the first time, the paintings that make up The Black Garden are the result of long artistic processes that involves layering oil and resin to produce an inner and an outer image on the canvas. They are accompanied here by essays that place the series—Wizemann’s largest to date—within art historical context and reveal literary connotations along with formal and conceptual relations, ranging from the Renaissance to Wizemann’s contemporaries. Wizemann is a fascinating figure in Switzerland’s art scene, and this richly illustrated book offers an accessible introduction to his most recent work. , born 1992, lives and works in Switzerland as a scholar of art history and a freelance curator. , born 1960, is a grammar school teacher in St. Gallen, Switzerland, who also works as a writer, translator, and editor.